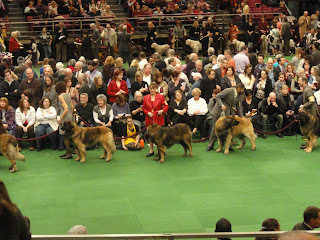 Events & Blog: CHEWEE AT WESTMINSTER!! FEB 15, 20011 WESTMINSTER IS HERE! Chewee and Karen did a fantastic job in the ring. They looked magnificent and he performed like a king. Chewee's friend Gulliver (the dog on the right) took Best of Breed. And Chewee enjoyed all the media and press. It was a day that will go down in Leonberger history.